Williams: Formula 1 in the Blood - If you didn't catch it on BBC Two a few weeks ago, you can watch the documentary on BBC iPlayer. It details the life of Sir Frank Williams, and his horrific accident in 1986. Bring tissues, because there's a rather large chance your eyes could rain. Formula E in Hong Kong 07:00 GMT Sunday 10 March - You can watch this across the BBC (repeats and highlights will be available if you want a lie in). It's on BBC Two, BBC iPlayer, connected TV and online. It's gearing up to be an epic race, particularly since the previous three races have been an edge-of-your-seat finale... check out the video below for evidence. Australian Grand Prix 15-17 March - The moment we've all been waiting for. It's two weeks until we're back under way with our usual service. Our BBC Radio 5 live commentators Jack Nicholls, Jolyon Palmer, and Jennie Gow will be back with live commentary and the Chequered Flag podcasts; and of course, we'll be back here as usual. Formula E - Saturday 23 March - Following Hong Kong, Formula E continues in China, coverage will be across the BBC. IndyCar series: 10 March: Firestone Grand Prix of St Petersberg, and 24 March: Circuit of the Americas. So what did we see over those eight days? 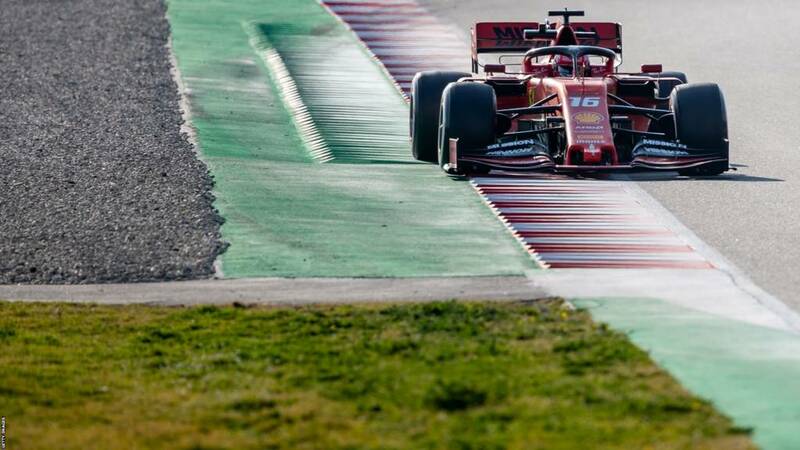 Ferrari have impressed, Mercedes sandbagged until the final hour on day eight - now they're having a sniff at Ferrari's pace (but of course lap times should be taken with a pinch of salt). Each team has a had a problem, some have been rectified, and other teams like Red Bull will be scratching their heads for a day or so. The rookies have got some of their gravel runs and crashes out of the way, and there's a load of data which needs to be analysed within two weeks when the tyres meet the tarmac for the first race of the season. Lewis Hamilton says he is braced for his "toughest battle yet" after conceding Ferrari have had the best car in pre-season testing. The five-time world champion believes his Mercedes team's deficit to Ferrari is "potentially half a second". However, Hamilton ended the final test day just 0.003 seconds slower than Sebastian Vettel's pace-setting time. "Last year there were many occasions we as a team were behind on performance and had to achieve," Hamilton added. "We were not behind anywhere near as much last year." Ferrari have been consistently quick during two weeks of testing in Spain and their car has proved easy to drive and fast in all conditions. The Mercedes, by contrast, has been difficult to balance and prone to tyre problems. Red Bull had a frustrating last day, but the plan is for the team to carry out a filming day on Saturday. That will amount to little more than the chance to check the car’s systems all work after today’s problems, but it’s better than not having that track time. For the majority, it’s time to head for home after two weeks away. Sift through the data and, in just 14 days, go racing again. So in the remaining minutes, Kevin Magnussen brought out a red flag - which didn't last very long. Hamilton, Hulkenberg and Kvyat went out for one final blast before the chequered flag was waved. But Sebastian Vettel remains the quickest of the day, and Verstappen never managed to get back out on the track again. Four minutes left of testing. Hamilton is still 0.003 behind Vettel's time for today. The only driver out on track is Kevin Magnussen. It looks like everyone else has gone home for the week. SpaceBoy: Whatever you make of #F1Testing times I think Australia is sure going to be an intriguing race, more so than in the past few seasons! MarcusM: Haha! So Merc WERE sandbagging after all! Kumaran Ravendradas: Mercedes have probably been driving a giant Anvil in the back of that car. Because they have pretty kept their times near the bottom but always done the most laps. It's clearly mind games. The driver have consistently said Ferrari are faster. Thorpey: I hate to put a damper on all the reliability praise but the ambient temperature at most races will change everything. I think he's starting to suit Alfa Romeo colours. So, an error on the timing board earlier showed Verstappen had done 100 laps. But he's still in the garage and hasn't emerged since the gear box issue. Saud Ahmed: I know we don't know the fuel loads and engine modes etc of Carlos Sainz's McLaren on the current long run but it's interesting to see he's consistently in the low 1:21s. Asroth: The main thing that really stands out from the 2 weeks of testing is how reliability has improved for all teams, even Williams have had a decent amount of laps this week despite the problems of last week. Rather exciting prospects this season has. James Hutton: Lewis’ lap was on the C4, sneaky that they waited till Ferrari packed up, the plot thickens........mo ha ha ha haaaaa! Hamilton is unfathomably close behind Vettel's time today. Both times are on the C5 tyre which is the quickest of the set. Rachel T: What testing never tests is driver skill and team performance under pressure. Time and time again HAM and Merc have been waaaaay superior in this regard. Bring the 2019 F1 season on! Richard Knight: Ferrari looking strong but Merc will be right up there again. Alfa have looked solid and could surprise a few. David Cheeseman Eagles: McLaren to be the wildcard team of the 2019 season, mark my words. George Parker: Who's Looking good- Mclaren, Who looks in trouble- Mclaren, Whos going to be a surprise- Mclaren, And my wild car is.... Mclaren. Teams regularly say they are only focusing on themselves during testing. And teams are always lying. There are hundreds of people in each F1 team and somebody always has the capacity to be keeping an eye on their rivals. Performance is relative after all, so teams want to know where they stack up in order to understand their own targets. But also traits of different cars could be key in race situations - for example if one car goes through tyres quickly then that’s helpful information for rival strategists. Gil de Ferran admitted McLaren are working hard on trying to work out the competitive order, and Alfa Romeo have had team members taking a look trackside on a number of occasions this week. Is where Mercedes are finally showing some pace after eight long days? With the teams packing up, and an hour and 20 minutes to go, what are your initial thoughts on the season? Who's looking good? Who looks in trouble? Who's going to be a surprise? And who is your wildcard? Tweet us with the hashtag #bbcf1. Welshguy_78: After testing, I'm gonna say that @ToroRosso could be the dark horse this season. Super fast car, extra year to integrate with Honda, reliable and 2 drivers with something to prove. Have flown under the radar, but their speed looks impressive! Alistair Macdonald: I'm not buying the pace from Hamilton at the moment. I don't think he's done a flying lap yet. Charlie Singleton: Even if there is a performance gap between Mercedes and Ferrari when we get to Melbourne, I think this entire season depends on how reliable the engine units are going to be and Ferrari power units seem to have had the most problems so far. Sebastian Vettel has been in the garage for a while with an electrical issue. The team don't believe it will be fixed in time to get some more laps in today.